The concept of the comfortable melody line is close to Pythagorean scale. Even Today, the performance without the accompaniment tend to use this pitch. On the other hand, in the music that uses lots of simple triads, Pythagorean 3rd [408 cents] is not comfortable. Especially in organ music, the howling made from the holding notes, almost sounded like a dissonance. When this is compared with pure 3rd, it makes a sound of 20% higher sound, this causes the dissonance. The mean-tone is conceived to leave the pure 3rd of Just intonation, solved the problem of D-A very narrow 5th, and bumpy scale. In order to keep the pure 3rd, the 5th of [ D-A 680 cents ] is shared with four other 5th and make all the 5th quite narrow. When Polyphonic music flourished in the time of Renaissance, mean-tone system was used for pipe organ. Triads of pure 3rd symbolizes the chord of prayer. The primary triads have no howling, gives a dignified and steady sound. Subsequently, I made step-wise graph of the mean-tone scale. 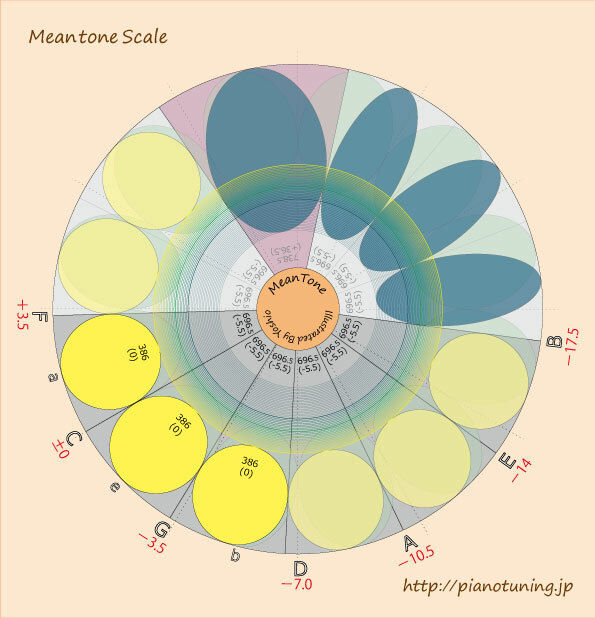 When this is compared with step-wise graph of just intonation, you can see more meanings of the mean-tone scale, which could not be seen in comparison of harmony. Whole tone is 193 cents exactly in the middle miner whole tone and major whole tone of Just intonation. Semitone in 117.5 cents, this is much wider than semitone of just intonation 112 cents. The step-wise graph of Pythagorean is contrasting, but the steps are not as uneven as just intonation. Concept is to make major 3rd into pure 3rd. Therefore, E, A, B are quite low. Aaron’s mean-tone consists of G♯ -E♭（wolf : wide 5th）cold be described with this step-wise graph till the range of the keys of 2 flats and 3 sharps. The semitone is wider than the equal temperament. 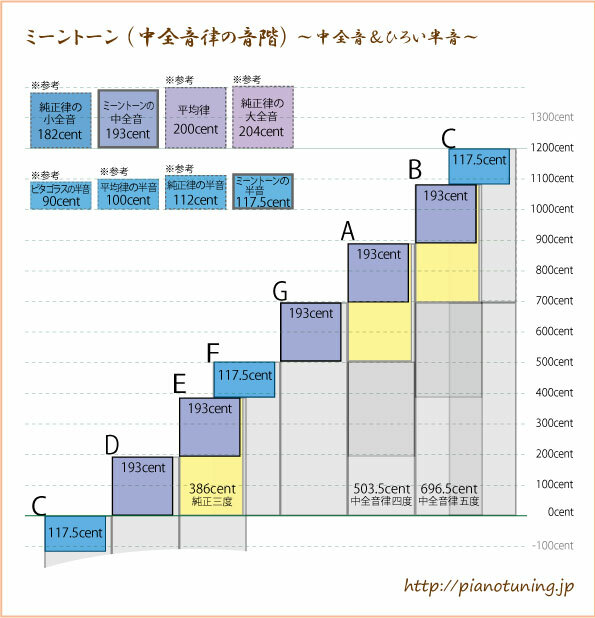 May be mean-tone scale is not suited for the melody line: when leading tone resolve to tonic.